Ten years ago, Thames Computer Services made the strategic choice of putting the Empress RDBMS at the heart of its flagship product, ADvantage. The end result is a dynamic media buying, production and financial administration system for advertising agencies, studios, public relations companies and similar organizations. ADvantage is designed for the user. For networked users, the multi-user system provides fast access to data in the Empress RDBMS via an intranet or Internet connection. 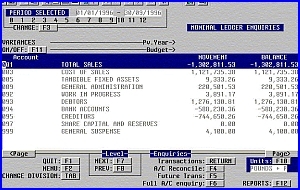 The customized, mouse-driven, graphical user interface was developed using Empress 4GL and Multiview 2000, terminal emulation software by JSB Software Technologies (www.jsb.com). With convenient pop-up windows, ADvantage provides a wealth of consistent functionality and ease of use to all levels of an organization, simplifying the challenging administrative environment of an agency. The fully integrated system can be used with a variety of networks and software applications including E-mail, spreadsheet, word processing and presentation packages. Data is seamless new information is automatically distributed throughout the system. Data tracking is also performed, enabling the system to maintain a history of information. Based on the Empress RDBMS, ADvantage is designed as an open system using UNIX and TCP/IP. It is available on multiple UNIX platforms including Linux, Solaris and SCO OpenServer. ADvantage also runs on diverse hardware, ranging from high performance servers supporting hundreds of users, to single-user PCs and MACs, to terminals.
" After thorough investigation of other databases, I put the sophisticated technology of the Empress RDBMS at the heart of ADvantage. Ten years later, it continues to be a reliable, advanced development environment that I am confident will serve us for years to come." From media buying, to job and financial account management, ADvantage is a solid data management solution for companies needing efficient administration, tight financial control and timely information management. The ADvantage accounts suite is available to other system developers to integrate with their applications.